Pioneer brand multi split heat pump system, complete set. System components include: one multi zone outdoor unit, matching multiple wall mount indoor units, piping and accessory kits and remote controllers. Pioneer multi split systems are available in 4 versions for 2, 3, 4 and 5 zones. They provide totally decentralized and independent zone control for perfect climate in each zone or room. Each zone can be individually and independently set to be on or off, or to run with different temperature settings (only exception is that system can not run both heating and cooling modes simultaneously for different zones). each indoor unit can be chosen from 3 different capacities 9, 12 and 18000 BTU, to match the zone loads. Indoor units automatically adjust their capacities up and down in real time and as needed to match the zone's cooling or heating loads. The outdoor unit will also adjust its total output based on the total demand it receives from all simultaneously running indoor units in real time. This function results in significant energy savings. Systems use single point power entry to the outdoor unit only and indoor units receive their power from the outdoor unit. Multi split systems and complex systems to install for an individual without proper tools and training. Installation of such systems must be performed or supervised by a capable professional. Systems can be customized for the indoor unit Capacity combination as well as the pipe kit lengths for each zone. The standard price includes the system matched 12,000 BTU wall mounted indoor units and 16 foot pipe kits. Variations can result in small cost changes which needs to be paid separately to the supplier. Please call 800-243-0340 immediately after placing your order, if you require any customizations. Please also visit high seer com web site for full technical specks and other documents provided. For full tech specks and other information, pls refer to highseer web site. 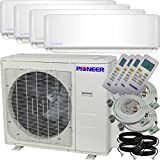 Pioneer brand ductless INVERTER mini split air conditioning systems are well known all over the world for their quality and performance. Although, a little known in North America, ductless mini splits have been the system of choice in most countries and regions all over the world, due to their simplicity, versatility and cost effectiveness. Installation of a Pioneer mini split system is a breeze. With a Pioneer ductless mini split air conditioning system, it is possible to heat or cool each room in a house, totally independent of the other, quietly, effectively and efficiently. 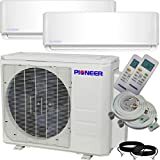 Pioneer brand WYE series ductless INVERTER split heat pump systems come in 3 different capacities; 12000, 18000 and 24000 BTU/Hour. WYE is the most economical INVERTER model in the Pioneer model line up. Included wireless remote controller allowing the users easily select among the 4 operating modes; Cooling, Heating, Dehumidification and Ventilation. Additionally an automatic switchover mode is available for totally automatic operation through its on board computer. A timer function allows the user to set the system to start or stop running at a certain time. Night mode function automatically adops the temperature settings to the human body's naturally changing temperature levels during the night. Auto restart function memorizes all settings in case of a temporary power failure and restarts the system to continue running the same way after the power is reconnected. Last but not the least, an automatic swing discharge air louver gently changes the direction of the air flow in a sweeping action for total comfort. With the ever increasing popularity of ductless mini split systems, there are many unknown brands trying to penetrate the market. Buyers interested in a ductless split heat pump are encouraged to consider buying a reputable brand, such as Pioneer, to be assured of their top quality and performance. Pioneer's newest design attractive appearance, powerful and dependable performance. For full technical specks and other Information, Please refer to the highseer web site. 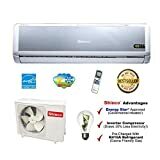 Pioneer newest ways series wall mount mini split ductless Inverter air conditioning and heat pump system. Full system set, containing indoor section, outdoor section, remote controller and standard installation accessories. With a pioneer ductless mini split type air conditioning system, it is possible to heat or cool any contiguous area, quietly, effectively and efficiently. Pioneer brand ways series ductless split heat pump systems come in a range of capacities; from 9000 BTU/hour to 36000 BTU/hour. Ways is an Inverter system with variable Speed compressor, providing very high efficiency levels. Included wireless remote digital controller allows the users easily select among the 4 operating modes; cooling, heating, dehumidification and ventilation. Additionally, an automatic switchover mode is available for totally automatic operation through it's on board computer. A timer function allows the user to set the system to start or stop running at a certain time. Night mode function automatically adopts the temperature settings to the naturally changing body temperature levels during the night. Auto restart function memorizes all settings in case of a temporary power failure and restarts the system to continue running the same way after the power is reconnected. Cloud programmable Wi-Fi remote access function is also available. Smart buyers choose pioneer brand Inverter split systems for their top quality, reliability and performance, available at extremely affordable prices. For full tech specks and other information, pls refer to highseer web site. 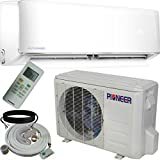 Pioneer brand ductless INVERTER mini split air conditioning systems are well known all over the world for their quality and performance. Although, a little known in North America, ductless mini splits have been the system of choice in most countries and regions all over the world, due to their simplicity, versatility and cost effectiveness. Installation of a Pioneer mini split system is a breeze. With a Pioneer ductless mini split air conditioning system, it is possible to heat or cool each room in a house, totally independent of the other, quietly, effectively and efficiently. Pioneer brand WYQ series ductless INVERTER split heat pump systems come in 4 different capacities; 9000, 12000, 18000 and 24000 BTU/Hour. WYQ is the most Efficient INVERTER model in the Pioneer model line up. Included wireless remote controller allowing the users easily select among the 4 operating modes; Cooling, Heating, Dehumidification and Ventilation. Additionally an automatic switchover mode is available for totally automatic operation through its on board computer. A timer function allows the user to set the system to start or stop running at a certain time. Night mode function automatically adops the temperature settings to the human body's naturally changing temperature levels during the night. Auto restart function memorizes all settings in case of a temporary power failure and restarts the system to continue running the same way after the power is reconnected. Last but not the least, an automatic swing discharge air louver gently changes the direction of the air flow in a sweeping action for total comfort. With the ever increasing popularity of ductless mini split systems, there are many unknown brands trying to penetrate the market. Buyers interested in a ductless split heat pump are encouraged to consider buying a reputable brand, such as Pioneer, to be assured of their top quality and performance.